Renée Fleming stars in the title role of one of Handel’s greatest dramas, seen in Stephen Wadsworth’s 2004 Met premiere production. 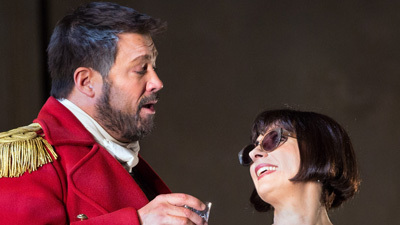 Rodelinda is faced with an impossible dilemma: With her husband Bertarido believed dead, she either has to marry the despised Grimoaldo (the elegant Joseph Kaiser), who has usurped her husband’s throne, or see him murder her son. But Bertarido (leading countertenor Andreas Scholl) is alive and eventually reclaims both throne and wife—and makes peace with his enemies. Stephanie Blythe is marvelous as Eduige, Bertarido’s sister, who is betrothed to Grimoaldo but turns against him. Baroque authority Harry Bicket conducts.